Aotearoa, Maori for the land of the long white cloud. New Zealand is home to some of the most beautiful and breathtaking landscapes in the world. The country is divided into two islands, where 4.6 million people and over 29 million sheep live (yes we have more sheep than people). It is where the Lord of the Rings movies were filmed and home to the best sports team in the world—the All Blacks. Hikers Paradise: New Zealand has many treks suitable both for newbies and experienced hikers. Both islands offer thousands of options for people who love hiking. The options for sceneries are also very varied, including forests, mountains, valleys, lakes, and rivers. One of the most appealing characteristics of hiking in New Zealand is that there are no dangerous animals—no poisonous snakes, no deadly spiders, no dengue mosquito. So hike away with beauty and safety (remember to ensure you let someone know where you are going hiking and stick to the designated paths). 2. Beaches: Being an island (two actually), Kiwi’s have easy access to a vast amount of beaches. The country has over 29,000 km of coastline. Even in cities like Auckland, clean, beautiful beaches and ports are widely available, and some can even be accessed via ferry. 3. Incredible Nature: New Zealanders have done their best to preserve the natural habitat of the country. 13 national parks, 3 maritime parks, and hundreds of natural reserves are open for tourists. Moreover, there are several special rivers & lakes, which are protected by the government. In total, around 30% of the country’s land area is protected conservation land. Only here, can a river be considered a “legal person”. 4. Safety: The crime rates here are very low compared to other countries. New Zealand is the fourth safest country in the world. 5. A wide range of touristic offerings: It doesn’t matter whether you have a wide or tight budget—you will find an option that suits your pocket as well as your interests and time. From North to South you will find varied places to visit, so maybe the only difficulty would be to choose which ones! 6. Amazing Road Trips: Renting a car or even a camper van for your road trip is very easy. 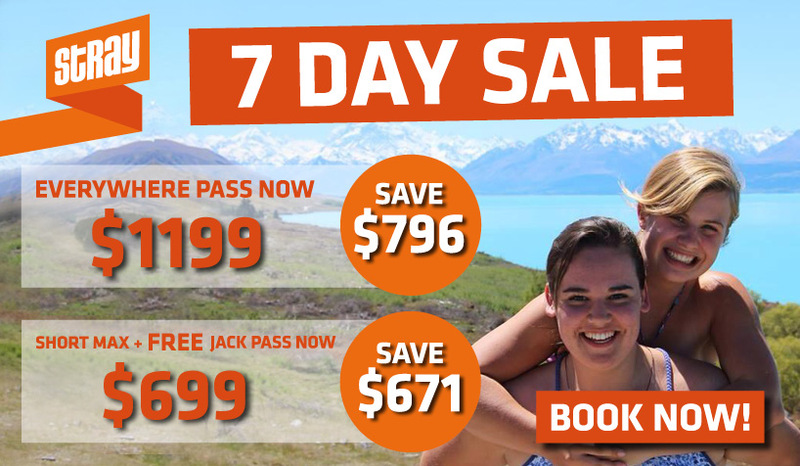 For backpackers, students, couples, and even entire families, driving around New Zealand for vacations is a popular activity, especially during summer. 7. International Environment: If you want to meet people from all over the world, this is the best place to do so. Auckland, the most populated city in the country, is like a mini New York. It is a cosmopolitan and diverse city where people from all over the world converge. 8. World’s Extreme sports capital: If you are an adrenalin lover, this is the place to be. Kiwis created the first bungee jumping in the world and the range of extreme sports is very interesting, you can choose skydiving, bungee, rafting, caves, zipline, canyoning, and much more. 9. Just happiness: The kiwi attitude is all about being happy and chilled. The fun thing here is that it is contagious. This entry was posted in new zealand, Travel and tagged hiking, lake pukaki, nature, new zealand, safety, travel on August 3, 2017 by INTERNeX New Zealand. Whale watching in Kaikoura: While sperm whales hang out in the Kaikoura coast all year round, come winter the humpback, pilot, blue and southern right whales stop by on their way from the Antarctic to the tropics! June to August is the best times to see them, plus with the added bonus of the beautiful snow capped mountain scenery. Hanmer Springs: Hanmer springs is located between Christchurch and Kaikoura, and is considered one of New Zealand’s best hot springs resorts. With picturesque scenery surrounded by snow-capped mountains, the famous thermal pools and spa (co.nz) are a beautiful place to relax. Queenstown: Know as the adventure capital of NZ, Queenstown is the perfect place for a winter adventure! With world class ski fields, beautiful scenery, bars, ski-touring and more, you’ll be sure to see some of the best winter scenery there is to offer. For the snow sport lovers: NZ is home to 18 commercially operated ski fields. The three main regions that are popular among tourists are Mount Ruapehu (in the central North Island), the Southern Lakes (Queenstown and Wanaka in the South Island), and Mount Hutt (near Christchurch in the South Island). NOTE: Stay safe on our roads. Be sure to take extra care on road trips, especially in winter where the roads are often icy. Make sure to check the conditions before beginning your journey, ensure your car is road safe with all defrosters, heaters, indicators, lights, tires, etc. are all in good working order. We’d love to hear about your winter adventures. Let us know what you’ve got planned for the upcoming winter months in the comment box below. This entry was posted in Festival, INTERNeX, new zealand, Travel, Uncategorized, What to do on the weekend, winter and tagged INTERNeX, new zealand, roadtrip, skiing, snow, weekend trip, winter on June 9, 2016 by INTERNeX New Zealand. Kia Ora Everybody! We hope you had a great weekend, because we definitely did with an amazing Stray tour up to the Bay of Islands! On Saturday the 11th of April, Me (Yoran), Esmerlin, Joyce and two INTERNeX Participants started our great weekend full of fun. Our stray driver Muesli picked us up in front of the Stray office in Auckland at 7:20 AM (damn that was early). On our way to the Bay of Islands we made several stops. We stopped a few times to use the toilet of course, but we also stopped at a huge Kauri Tree to do some tree hugging. After that, we stopped at a cute little farmers market to grab some breakfast. We want to thank Stray for this great weekend! If you have anything that you would like to do, and you would like to do it in a group, let us know! You can send us a private message on our Facebook Page, or you can email us! This entry was posted in INTERNeX, Travel and tagged INTERNeX, new zealand, stray, stray pass, Straytravel, trip, weekend on April 13, 2015 by INTERNeX New Zealand. INTERNeX New Zealand: KIWI Experience Bay of Islands! 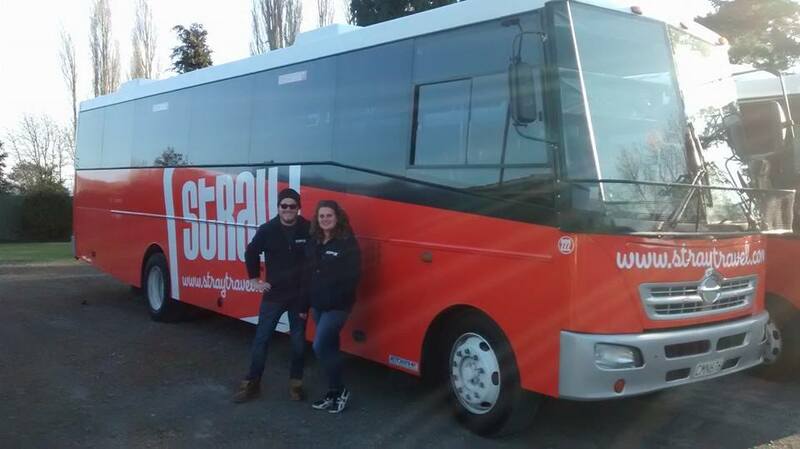 To give you all the best tips and information about traveling in New Zealand, our interns Anke & Jeroen hopped on the green KIWI Experience bus to the Bay of Islands & Cape Reinga last weekend! Only a couple of hours away from Auckland, you find the beautiful Paihia in the Bay of Islands! The names gives it away already, it’s a bay, filled with islands! 144 to be precise! There are so many awesome activities to be done and places to be explored over there! For example: Kayaking, parasailing, swimming with dolphins, relaxing on one of many beautiful beaches, taking a cruise or going to the far north for a day! There you can find cape Reinga with its famous lighthouse. And close to that, you can go sand-boarding on the sand-dunes, which is a great and unique experience! Even cruising back to Paihia by bus is awesome, because the bus driver gets a bit bored of the normal road, they will just use 90-mile beach! Which is actually 55 miles (or 90km) long..
A big thanks to CK and the KIWI Experience crew for having us! This entry was posted in Travel and tagged bay of islands, cape reinga, KIWI Experience on November 26, 2014 by INTERNeX New Zealand. 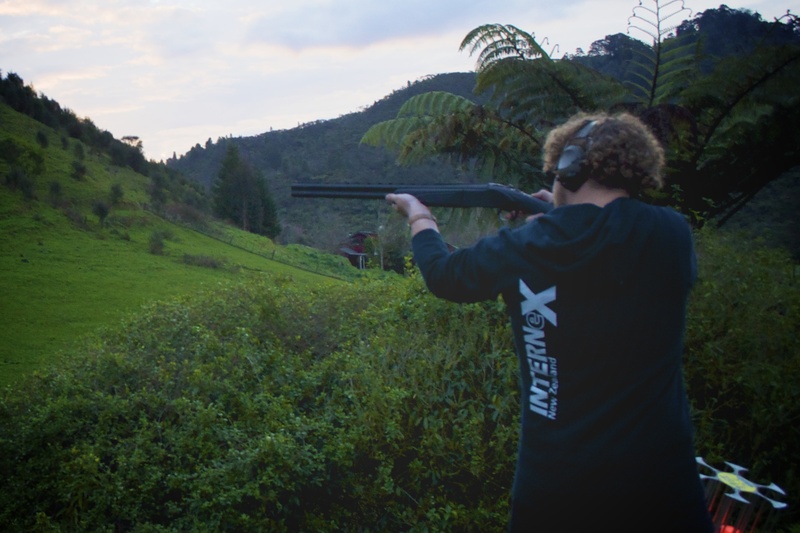 INTERNeX New Zealand: Stray Famil Trip! 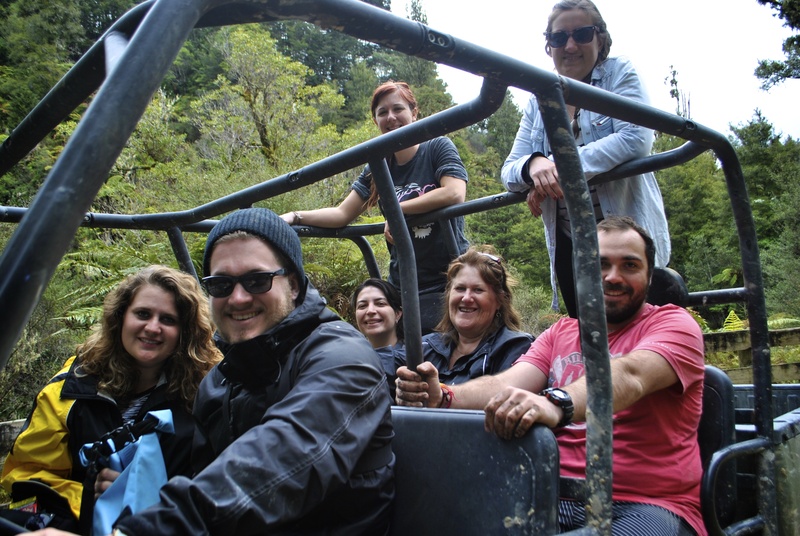 Our interns just got back from an amazing week traveling the north island of New Zealand together with a bunch of travel agents from around the country and Australia! Thanks to Stray Travel, Anke & Jeroen had the amazing opportunity to see some of the North Island, it’s beautiful nature, culture and people. The first day started off in Auckland, with the destination: Raglan, the surf capital of NZ! After some surfing it was time for fish & chips! The second day was all about the Maori culture, after visiting a Marae (Maori meeting house) there were some classes in weaving and ealing! On day 3 and 4, the group went over to Blue Duck Station, which was pretty much in the middle of nowhere! Without a cellphone signal or WiFi, it was time for having a beer around the bonfire, riding a horse across the beautiful hills and some clay target shooting! A big thanks to DC over at Stray to offer us this opportunity! And the rest of the Stray crew off course! Cheers! This entry was posted in Travel on September 30, 2014 by INTERNeX New Zealand.